Over the last several days I have found more reasons to believe that Breaking Amish isn’t being upfront and is actually outright deceptive. Crushable has finally come out with an article that questions the authenticity of the show. Hopefully the lies will be revealed by mainstream media before too many people get false impressions about the Amish. Below I have some specific information on Abe, Rebecca, Andy, and the two Bens. Abe and Rebecca are allegedly a couple, have been for quite some time, and apparently have a child together. The picture below seems to support that allegation (source: https://www.facebook.com/BreakingAmishTheTruth). Click on the image to see the full-size version. This picture of Abe and Rebecca was apparently on his brother Andy’s Facebook profile and it was taken sometime in 2011. This Facebook profile appears to be Abe’s brother Andy. 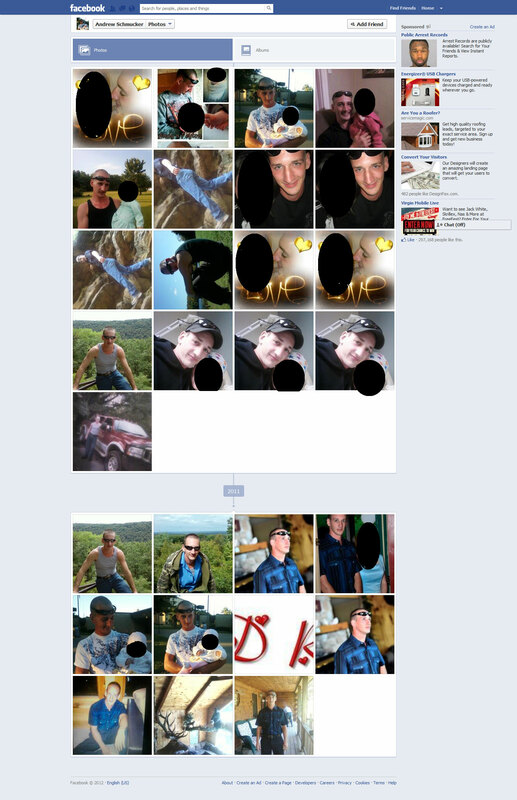 Below is a screenshot of his public photos as shown on Sept. 11, 2012. Click on the thumbnail to view the full size. On Breaking Amish, Andy is portrayed as being Amish, he’s not one of the five leaving for New York. In his Facebook photos, however, he doesn’t appear to be Amish (assuming it really is his profile). Some of the photos were uploaded in 2011. On Breaking Amish, two men, both named Ben, are portrayed as Rebecca’s Amish cousins. I found a Facebook profile for someone that looks like one of the Bens. He also looks like the creepy relative who hid behind the curtains in an upstairs window after Rebecca spoke with the person portraying her grandfather. 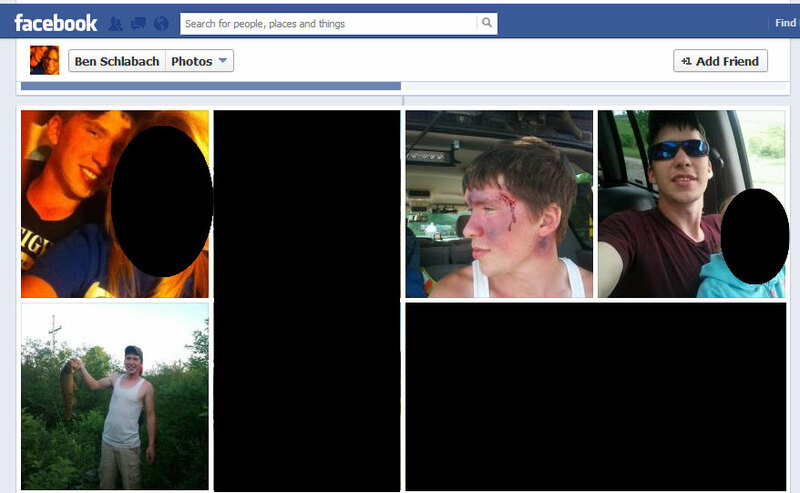 Here is a screen shot of that guy’s public pictures, taken on Sept. 11, 2012, before he hid or deleted his profile. In these pictures he does not appear to be Amish. Click on the thumbnail to see a full-size version. Ben from Breaking Amish episode 1? “Breaking Amish, premiering Sunday, Sept. 9 at 10|9c, provides a never-before-seen look inside the lives of young men and women as they, for the first time, trade horse and buggy with taxi cabs to break out from their respective Amish/Mennonite communities in their pursuit to chase big dreams in the Big Apple. The groundbreaking series features nine hour-long episodes. I have bolded and underlined the part which is definitely not true. The rest of it is suspect. Come on TLC! Just admit that you made a mistake. Revise the description on your website, make a public apology, and preface each showing of Breaking Amish with the disclaimer that it is staged and scripted and that it is played by actors who left the Amish some time ago. The last couple days this blog has received 3000 to 4000 views per day which is significantly higher than normal. Of course, WordPress promptly puts advertisements on my page. Sorry about having to put up with those. I just wish I’d be the one making money with them. The lies!!! Reality tv isn’t real. 😦 I’m really curious about the Amish. i watched this, was a good show. Although I am still questioning why they chose to be filmed. She was visably upset thinking she could get ex communicated. I had watched this awhile ago and thought it was great. I recognized the house since it’s not far from me and did a little checking (public records in Lancaster County are great). The family appears to still own the house where this was filmed along with the business and another house in Gordonville. I could find no record of them having purchased a farm in Lancaster County, as is shown in the end. It made me question whether the ending was set up in any way. On the other hand it was a great program and there’s probably a reasonable explanation for why there’s no record of the farm. As far as I can tell, the BBC is usually pretty accurate in their depictions of the Amish (see Amish on Break, Living with the Amish). Anyway, we have enough controversy with Breaking Amish as it is. Hey, thanks for the offer man! I migrated this blog to a custom domain just yesterday and am now displaying WordAds on it. That should bring a little money in. Not nearly enough to justify not getting much work done the past week, of course, but Oh well. Very interesting! Great exposé. Maybe someone would pay you some money for writing an article about this in a newspaper or on a news site? I did watch the first episode, but after reading your texts about this show, I won’t be tuning in any more, not even out of curiosity. Not for a second did I think the show was real, no “reality” shows are. But I didn’t realize how severe the deception was. I understand that reality shows use some creative editing to make them more exciting. For example, after a scene is filmed, they might record voice-overs that they edit over the scene. This means that when they record the voice-over they have to talk in present time, e.g. “I feel”, “I want” etc, even though the events have already been filmed a while ago. But what Breaking Amish is doing is messed up. I naively thought that these kids might have left their homes just a while ago, so that there would be at least some kind of authenticity to the show, even though it was obvious that the scenes were staged. Now, watching them pretend to see a shower for the first time isn’t entertaining any more, just infuriating. I hope TLC faces a massive backlash over how dishonest they are about this show. Also, I like the other articles on your site. As an atheist myself, I spend a lot of time on-line reading about issues relating to a/theism, but I wasn’t aware of your site yet. Now I’m bookmarking it. According to this press release, Breaking Amish began filming in May 2012. It looks like the producer of Breaking Amish is subscribed to you on Facebook, so I assume that you two know each other on some level. I hope you understand if I choose not to believe you. Clearly you can see a picture of Abe and Rebecca with their baby born in 2011 where Rebecca has her real teeth and in the filming she has false teeth so this could not have been filmed 3-4 years ago. Thank you for your work. I had actually heard a lot of these truths from my daughter who married into an Amish family. She and her husband are not practicing Amish but many of his family still are and by word of mouth the community is NOT pleased with TLC and the untrue reality show. My daughter was actually banned from TLC’s site today for arguing with an administrator. They tried to tell her Amish didn’t pay taxes or have Social Security numbers. There are so many myths about Amish people I understand why there was so much interest for people to tune into a show like this and shame on TLC for airing such garbage. It should be truthful for the purpose of educating people who want the education of another culture because that is what it is not a cult which was also mentioned to my daughter. TLC should be forced to let the public know or remove this show from the air. Again than you for your work. Exactly. The problem isn’t so much that this show is staged (all reality shows are staged to some extent) but that viewers unfamiliar with the Amish are getting a grossly distorted picture of who the Amish are and what they believe. It’s less a matter of exploiting the kids involved (who seem to be willing participants) and more a matter of exploiting the viewers. GAR!!!! Amish people DO have social security numbers and pay taxes. They CAN choose to op out of the Social Security System. After Valentine Byler decided to fight the IRS over 4 years of back SSa tax totalling out to $308.00. In 1961 after poblic backlash over the draconian methods to collect the taxes in question, the IRS decided on allowing the Amish and other members of religious and moral objectors to opt out of Social Security and Medicare. In 1965 Congree passed this policy into law. In 1982 the law was clarified to state that only self-employed individuals can opt out, people who are considered “employees” are require to have the taxes withheld from their pay checks but can apply to have the money returned at the end of the year. Any first year CPA or Indivdual Tax Accountant can tell you this information. It’s one of the most basic parts of tax law that we have to learn. The Bayler case is also held up as an example of how public opinion and petitioning tax law can help make radical changes to the system. Yeah, there’s a general misconception that Amish don’t pay taxes when in fact they pay the same taxes as everyone else. They can opt out of social security if they’re self-employed or work at Amish businesses. But if they work for English employers, they do pay SS and usually get nothing in return. I saw this two after googling his name, it’s from 2008 for public intoxication!!! I did the same thing! arrested in 2008 for public intoxication! That was a lovely documentary. I am from Iowa where there are Amish and Mennonite folks. I’ve always been respectful of their privacy, and I really appreciated the glimpse into Amish life. I hope they didn’t get in trouble for it. Thanks for your blog. I have learned a lot! I’ve always known reality shows were fake from a friend of mine who worked for MTVs production company Bunim/Murray for 15 yrs, but what still gets me is that in this day of oversharing on places like Twitter, Facebook, and even MySpace, that the days of doing fake crap like this will always be outed. Shows can’t even do any kind of suspenseful endings because as we all know, we just have to follow these stars on Twitter to know what happened before the show even airs! So did the producers of this show not realize these people’s backgrounds wouldn’t come out? Well let me tell you, they don’t care. They sit in meetings with each other and laugh at all the people they know that will believe it because, well, it’s on tv. Filming reality shows take anywhere from 6-8 weeks, so with this show, they are already filming more episode for (they hope) another season. The two women on this show just appeared on Anderon Cooper ( dressed in their Amish/Mennonite dress) and said they were filming right now and when asked by Anderson if they went back to their families or stayed in New York, one of the sheepishly replied that he’d had to keep watching the show. You would think with Anderson Coopers reporting abilities, he wouldn’t have had to go far to investigate the authenticity of their roles. Yeah, I watched the Anderson Cooper interview this weekend and was disappointed as well. It was like a PR piece for TLC. The questions he asked were all superficial and he and his staff obviously didn’t do much research preparing for it. I am curious about Abe’s family, supposedly his mother, brother and sister, shown as Abe breaks the news to them in the first episode. They are supposed to come to NY for a visit on this week’s episode. How could they presumably be Amish in good standing and pull off this scam on nationwide TV? Well, shame on TLC for false advertising early on … which has now been corrected … but viewers of reality TV have to remember that no matter how “real” something seems, it’s just not. I think many of us are so used to being able to “like” our favorite celebrities on Facebook, follow them on Twitter, view candid pictures of them out and about in real life, and have any information we want delivered instantly via our smartphones, that we forget that life really isn’t an open book, and much less so when it comes to lives that are documented and presented in a way that makes someone money. To me, the take-away here is not that any of the cast members are “bad” people, and not even that TV networks are devious, but that you simply can’t believe everything you read – or hear – or see on TV. It’s entertainment! I would hope she doesn’t look like Abe! For those saying the show was filmed a while ago and Rebecca and abe got pregnant after the show, why on the picture above does Rebecca have her real teeth, then in the show she has dentures? Surely that must mean that this picture was taken before the show was filmed? Proof right there. This is not really for us to judge, but … even though it certainly looks like Rebecca and Abe are pretty comfortable together, isn’t it possible that this baby is a niece or nephew of one of them, or the child of a friend? If every baby I’ve ever held and taken a picture with were mine, I’d have a football team … but I’ve never had children. Just saying. That photo was submitted to https://www.facebook.com/BreakingAmishTheTruth by someone who knows Rebecca and Abe. this is more than enough proof to prove that the show is fake. for one, amish people sure as hell don’t have facebook pages – yet there are profiles of many of them? secondly, if you want to give them the benefit of the doubt and say that these are fake profiles.. how do you explain the pictures? for one, amish people do not take pictures because it is a vanity. for two, even if they did, they surely would not be wearing “english clothes” in them! even abe’s brother’s facebook has photos of him in regular clothing and with a truck, etc. not amish whatsoever. and if that’s not enough, in the episode that they were leaving for new york, kate was carrying a victoria’s secret tote bag. i have the exact same one, so i know for sure that’s what it was. pretty sure real amish people don’t go around shopping at victoria’s secret. Have none of you heard of the Amish Rumspringa? It is a period where Amish adolescence are able to for-go their lifestyle and live as English, drink, drive cars, have Facebook, and then decide if they want to be baptized into the Amish Church. Rumspringa can last as long as he/she decides but they cannot come back to the church or get married unless they have decided to end the period of Rumspringa and be baptized into the church or to leave their lifestyle and family forever. It is very very possible that Abe and Rebecca have a kid, but it is also possible that it could have been another family member’s child! (notice her real teeth in the photo, it is an old picture). While some of it may be staged, and they may have already (gasp) worn English clothes and drank, they are in essence on Rumspringa. YouTube has many good documentaries on Rumspringa. Check it out, check real facts about their lifestyle and religion, and then you’ll see it a lot of people are trying to ‘assume’ things without actually knowing what is going on. Maybe that is where TLC should have educated the viewing public a little more. I don’t know how far you’ve read on this site but yes, Rumspringa has been discussed. First that is mainly a Lancaster Amish tradition and while some teens do infact try life outside the community most do not. Also, Sabrina is Menonite which does not have a Runspringa. These cast members are being presented as already having joined the church and are now leaving, which is different. The person who maintains this blog does actually know as he was raised Amish. I have family near Gobbler’s Knob PA and have interacted with both Amish and Menonites when visiting for years. The best part of this show, there is an actual Amish Market in NYC near Battery Park. I’ve shopped there and it’s not far from where they are staying so Amish in NYC is not as unusual as they are acting. for those of you complaining that rebecca has teeth in that pic she said in the second episode she knew abe because they went to the same church. I don’t think that’s her though sh’es not THAT ugly! The alleged photo of Rebecca and Gabe is fake. Both of their eyes are poorly shopped right on. Not to mention Gabe’s nostrils. I’m not sure TLC is lying, considering I doubt this is not the first time they have left the Amish to try to make it in the “big apple”. Regardless of how long they have been away from the Amish, they probably have not tried to start lives in NYC. Either the picture is a shop or it is another persons kid. The type to leave the amish probably would have experimented with being “english” before leaving. I really doubt she had all her teeth pulled AFTER having a baby and AFTER leaving the amish…think people..think. perhaps it is more convoluted, but at some point she did have some barbarous dentistry, so how do you account for that? I disagree with your information. I was a Amish Taxi Driver and know some of these ex amish. I transported Rebecca many times. In fact I spent three days living with the Amish at a wedding of her great uncles in Ohio and Rebecca was there also. I know the Raber family also true his brothers has left the Amish sometime ago but that is the extent of your truth on that subject. If you like I can take you on a tour of the Amish communities where these young people lived and point out their homes. I know Rebacca natural father and what she said about that is completely true. Rebecca’s mother is now married to a English turned Amish. A few days ago, I watched 2 shows–they were called ‘documentaries’ according to the cable synopsis–one calld ‘Amish at the Altar’ & the other ‘Amish Out of Order’. I was wondering how realistic you believe these 2 ‘documentaries’ are? Some of the footage seemed true, & some seemed faked. The second story in ‘Amish at the Altar’–the one about the Beechy Amish seemed all fake. And the wedding of the ex-Amish couple at the end also seemed scripted. And the bedroom scene where the boy & girl were groping on each other in ‘Amish Out of Order’ seemed staged. I thought documentaries were suppose to be totally real, that’s why I watched these shows. But I have my doubts about these two. BTW, I quit watching ‘Breaking Amish’ because I KNOW that’s fake. And what’s going on with the women’s side-part? I thought all Amish wore a middle part in their hair? Some of the stuff seemed like it really wasn’t the Amish way of doing things. I could point out many things in these shows that didn’t ring true to me. I’ve watched parts of both shows that you mention and I would say Amish: Out of Order is the more accurate of the two. If that pic of abe and rebecca is real what really happened to her teeth? In that pic they are crooked and not her dentures. Im wondering where Abe and rebeccas daughter is? where is she for the 6 weeks they are being filmed?? 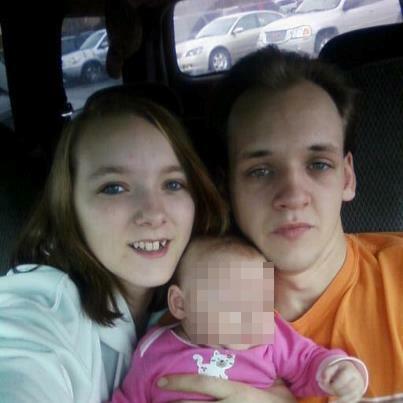 I jsut finished watching TLC’s Breaking Amish /Shunning Truth and saw the picture of Abe and Rebecca and “their” baby. On the show tonite the lady asking questions and Abe and Rebecca said she was carrying the baby and “just took a picture” with Abe and their was nothing wrong with that, BUT if you look closely in the picture, Abe was carrying the baby and Rebecca’s arm is behind Abe. Abe is carrying “their” baby like a loving father would so them denying that Abe is the father is a big scam, the both of them are I think they lied about almost everything just to get $, and Abe is Rebecca’s puppet, I think they got so engulfed in their lie that they mentally believe it. As for Kate, Sabrina and Jeremiah I believe their stories moreso Kate’s, she was pretty honest about her DUI which leads me to beleive she was telling the truth!!! Rebecca also said she had here teeth replaced with dentures so many years ago it was hard to remember but if you look at the picture of them in the car with the baby you can see she still had her real teeth.They lied about a lot Abe’s brother is saying the baby is Abe’s & so is Rebecca’s ex it’s all over there face book.I also wanted to know if this Amish mafia is real. After reading the comments about the program Breaking Amish, I’m left with the feeling that who cares if it is REAL or not. Who cares if it is a sham ? I, for one, t throughl enljoyed the series. It was a whole lot better watching that than the trash they have on the main network channels . It IS so much better than the series that have been put on about Gypsy weddings. Could you identify with that program. I could identify with the Amish program…I am not Amish….but I say leave them alone and let them live . I think the term Atheist is SO far-fetched. They are not atheist, they have been in a type of religion that was too hard to live with. Who would want to be shunned ? Take this program , with some introspection, If there are any more programs like this , excepting the Amish Mafia , I will watch with great interest. I was brought up in a very legalistic home and I think I kind of identify with them having “dreams” of being something else. Of course none of them are Amish. I know these people in person. They were Amish at one time like 10 years ago! Can’t stand kate or jeremiah. Just Rebecca an abe an Sabrina.